Forum for Cultural Cooperation Solingen-Minsk invited outstanding soloists. 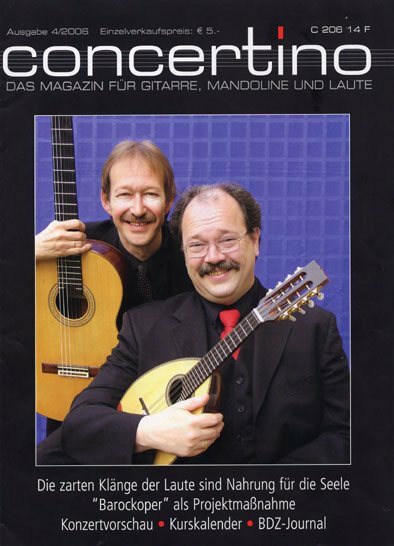 Two of the best instrumentalists, Detlef Tewes on mandolin, and Boris Björn Bagger, guitarist and professor in his home, the city of Karlsruhe, played for the cause of the "forum of cultural cooperation Solingen-Minsk" and reaped exuberant applause in the tightly packed concert hall of the Klingenmuseum for their matinee. They had cooperated in this unusual sound combination of mandolin and guitar to draw an astounding arc between the classical and the modern, but to also mediate between high music, salon music and a virtuosity that is pop music. This succeeded with good-natured virtuosity, exaltedly leaving behind the mere technical, and combining, as is fitting for mandolin, the rustic and the sophisticated. The mandolin rang in Italy and Spain, made the southern sun rise, and the black blood of melancholy flow, while poking much fun at salon-music. This convergence of music-historical presence and virtuosity became an entity of it's own and off-handedly introduced the listener to a variety of new techniques. Whether the enamored buzz of the mandolin was forced into sharp precision and an unusual stature, or whether the fire of the guitar itself burned above and beyond the regular mensuration. The agreement among the two musicians is so exact, and, at the same time, so full of ironic humor, that old and new was experienced in ways unheard before; the remembrance of Shakespeare's world in the composition of an unknown Englishman, the meeting with Niccolo Paganini, who had played guitar and mandolin before becoming world-famous as a violinist, the discovery of Astor Piazzola, of the Estonian composer Lepo Sumera, the sound discharges of Willy Althoff, who had personally dedicated this piece to the man with the mandolin, the passion of Heitor Villa-Lobos or even the sensational discovery of Carlo Munier at the end of this enchanted musical evening.